We’re really pleased with how Scran Salon has developed over the course of 2014. One of the benefits has been that we’ve been even more plugged in to the Edinburgh restaurant scene matrix and have had the pleasure of hearing about some really exciting and innovative ideas. One of our regular saloneers has been Amy Shepherd from Angels with Bagpipes. Along with her colleague Kirsty, she spoke at our August event, then has been at every event since, including another contribution to the December party (along with some very tasty canapes from the restaurant). 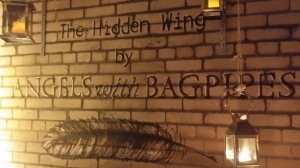 Her generosity extended to giving us the opportunity to come along to the third Hidden Wing event, a pop-up dining experience in the heart of the New Town. 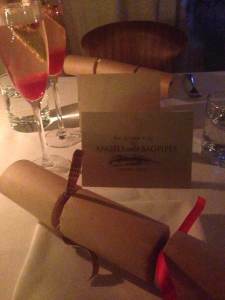 I was joined on this festive quest by Eleanor, a veteran of trips to The Magnum and Los Argentinos. Amy greeted us on arrival with a magical snowscape in the background courtyard. We were soon shown towards what looked like a rather unassuming door. The wizardry behind it entirely belied this humble appearance. We were welcomed with a cranberry, cointreau and prosecco cocktail, then left to consider the menu for the evening. Christmas crackling crackers started the culinary fireworks with moreish crunch. 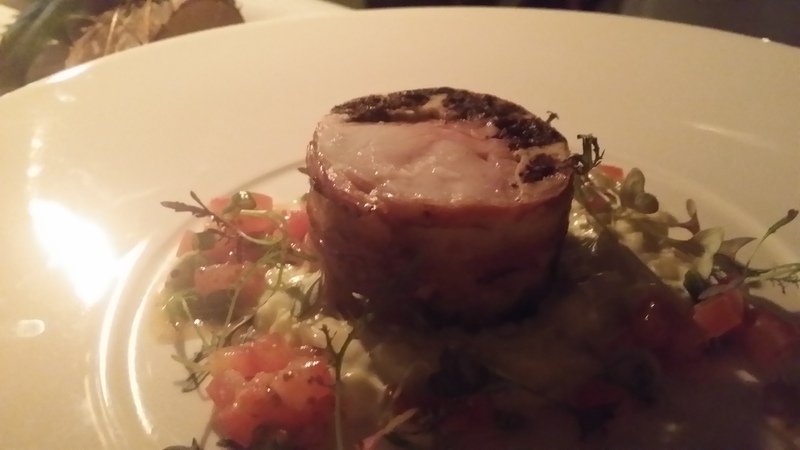 Our first dish was a bonnie looking rabbit loin wrapped in black pudding and pancetta on a bed of creamed leeks and tomato. It was a wonderfully light and fresh opener, well matched with a fine viognier. The fish course of steamed mussels in bisque with a parmesan crisp was beautifully matched with an outstanding riesling, which was the standout wine of the evening. Again, this was deft and elegant cooking. 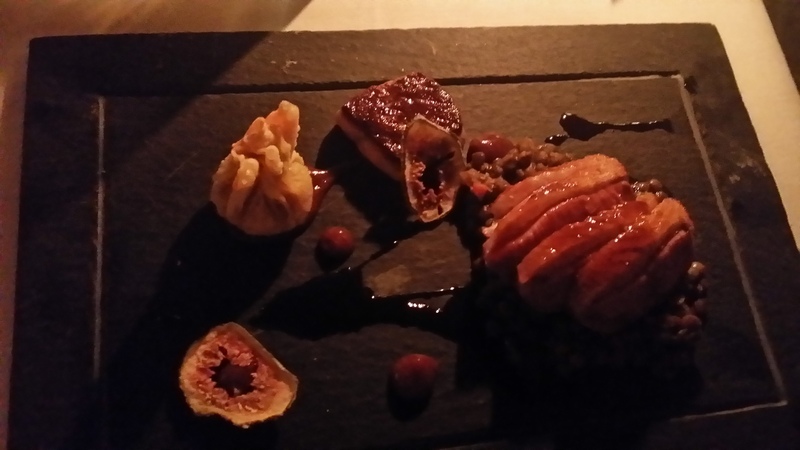 The main course brought together duck breast, duck leg in a wonton, foie gras, dehydrated fig and lentils. It was a luxurious and highly accomplished dish that was richly satisfying. The matching Lebanese red brought interesting complexity. 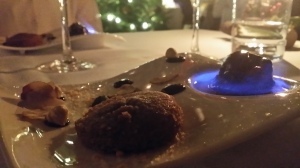 Dessert featured great theatrics, with flaming rum topping chocolate rum and raisin sorbet, a neat little sponge, and nutty detailing. It was outrageously boozy and highly memorable. Rounding things out was a deliciously festive cocktail, infusing mincemeat with calvados, marischino and cream. The fresh nutmeg topping was beautifully judged marking it out as a yuletide classic. So overall, the Hidden Wing was a highly impressive dining experience. It took the high quality produce on offer at Angels with Bagpipes to a new level of excellence, in an imaginative little venue. I’d strongly recommend checking out future events. I look forward to visiting again in 2015. When Blythe invited me to join him for a review, I was more than happy to come along. Then he said he didn’t know where we were eating. ‘All part of the experience,’ I was told. So on a typical December evening, I met Blythe and was promptly escorted past some scaffolding. ‘We’re eating on a building site!’ Blythe announced, and with the lighting up ahead it almost looked like we were – until we were directed through an archway into a charming courtyard lit with fairy lights. 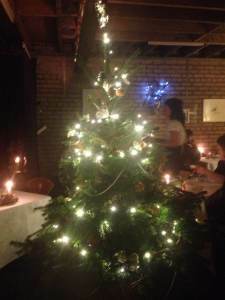 After entering what looked like a garage from the outside, I was taken aback by the delightful décor – fairy lights, Christmas lights and candles were all over the room with a Christmas tree at the centre. It had only just begun but I already knew we were in for a great evening. Greeted with a cranberry, cointreau and prosecco cocktail, we were left with the menu and crackers to start the evening. The first course soon arrived, a lovely rabbit loin wrapped in black pudding and pancetta on a bed of creamed leeks and tomato. It was delicious and light, and went extremely well with a fine Baron Philippe de Rothschild viognier. The fish course followed. Steamed mussels in bisque with a parmesan crisp was an incredible dish to match with an exceptional Australian Riesling. 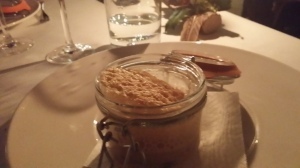 The seafood was present but not overpowering, working beautifully with the parmesan cheese. 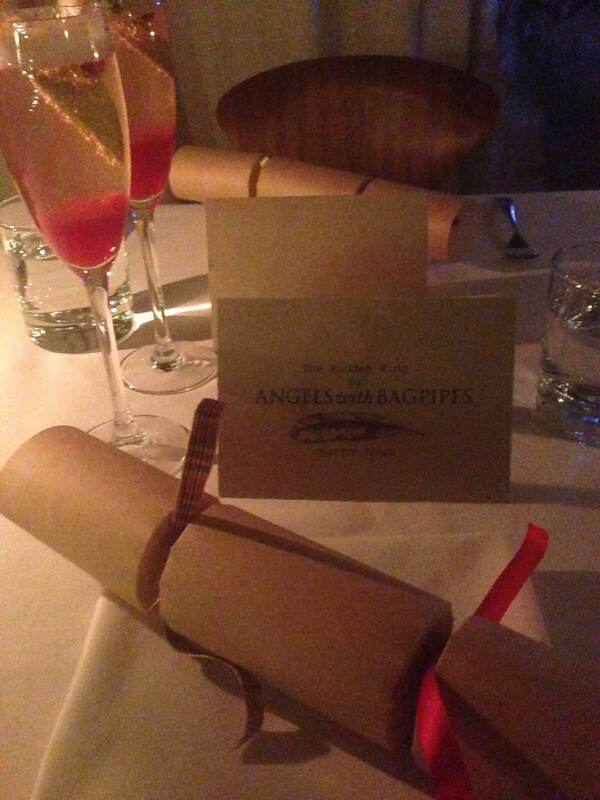 The elegance of Angels with Bagpipes was certainly reinforced with each course. The Riesling was the standout wine of the evening for Blythe, but I kept going back to the viognier. The quality of both wines was to such a level that I was spoiled for choice. The main course was a winner for any lover of game, and I do like duck especially. It was like Christmas come early with a plate made almost entirely of duck. Perfectly cooked pink duck breast sliced on top a bed of lentils, pan-fried fois gras, duck leg in a wonton and dehydrated fig. It was a splendid dish presented elegantly and balanced in each taste and texture. I enjoyed the duck immensely and the Lebanese red added another layer to the already complex game flavours. Dessert was an event in every sense of the word. 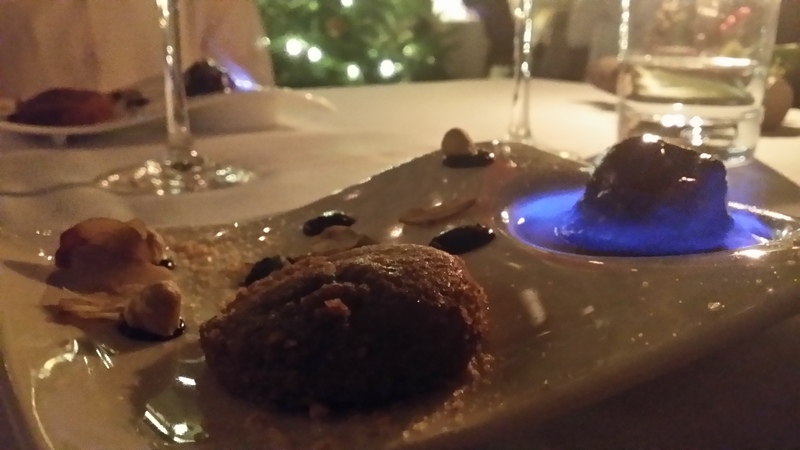 In Christmas-style, our dishes arrived a-flame and continued to burn for a good while. But we were in no danger, for there was more than enough rum for the flame to burn off and a good amount to remain in the bowl. This was an excellent way for the Hidden Wing to mark the season and time of year. The sponge was excellent for mopping up the rum with the sorbet adding a lighter tone. Amazingly boozy, and certainly a course that stayed with you. 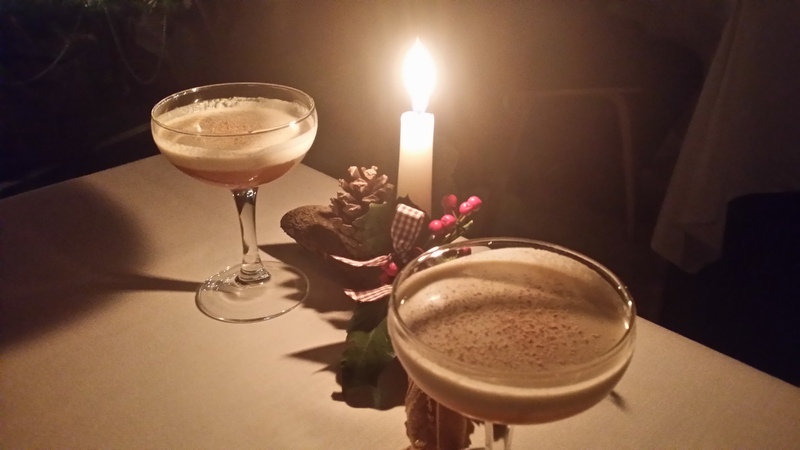 In true seasonal cheer, the final course of the evening was a delightful festive cocktail of mincemeat with calvados, maraschino and cream. It was certainly a unique first mince pie of the year, well almost a mince pie, and the touch of nutmeg on the top of the cream made all the difference. Total bill: food £40, matching drinks £20, per person, graciously picked up by our hosts.